We’ve been speaking in the classes this week about the black belt principle of “being a good-finder.” When I first heard the expression, I thought it was corny until I pondered it further and then saw its potency. Being a good-finder means that you find the good in everything, everyone, and every situation. Seem extreme and completely impractical? Well, if you think about it, one of the important skills in martial arts, Jiu-Jitsu especially, is the ability to resolve problems. However, if you panic, focusing only on your challenge, you get more deeply entangled in the problem. Looking for the right opportunity to advance, escape, and re-attack or reassert a position is critical for success. Applying this good-finding strategy in our everyday lives can be a very useful skill. After all, if we have the know-how to see the good in all, then our problems or whatever we’re facing will diminish in the face of goodness. This is very beneficial in examining our own behavior as well as how we perceive ourselves. We often view ourselves in the same negative and judgmental way as we view others. This is not uncommon; in fact, many times I’ve shrouded my contempt for others by using sarcasm. I didn’t have nice things to say, so I’d joke with intention of pushing my ridicule. Soon, sarcasm became my way of communicating in the world, and it was a real limitation! It did nothing to lift, elevate, or expand consciousness or solve anything. Learning to become the type of person who can be happy for other people by looking for the good is a worthwhile quest and reflects a quality of optimism and leadership. Positivity gives people promise of better things to come and unites them. The challenges and problems that we face tend to misguide us and turn us away from seeing the good, looking for the good, and listening for the good. We become fixated on worries. This leads us to high levels of stress and a solemn outlook on life, overall. Rather than provoking high levels of stress, why not generate high levels of thinking? The high-level black belt thinking means that the way we’re thinking will dictate our experience. 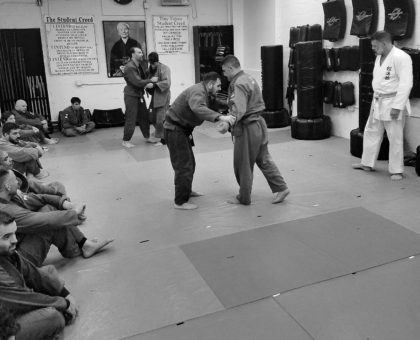 It’s what my teacher calls the “real mastery.” This is more than just a martial arts concept. This is a concept to apply under all circumstances. And once we begin to look for the good, listen for the good, and learn to speak good, we will demonstrate high levels of thinking, a true mastery that will manifest into high levels of living. Take this radical and profound stance as a good-finder by finding all the good you possibly can in life! Very deep and helpful review!